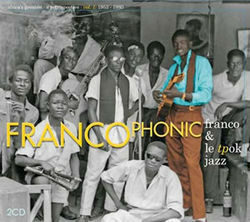 Congolese guitarist Franco is still widely revered as Africa’s greatest musician and this Stern’s compilation is a great insight as to why. The opening track ‘Esengo ya mokili’ was made at the age of 15, after he had come to attention as a brilliant street busker who built his own guitar at the age of 7. The double CD takes us through 27 more years with 28 tracks in total and extensive sleeve notes. Some called him the Godfather, others the Sorcerer, but we should just call him genius and revel in the brilliant music he created.